The Indiana Lawyer published the following article by Marilyn Odendahl on 25 February 2015. Text and photos are in the original article. The U.S. Military Commission Observation Project overseen by Indiana University Robert H. McKinney School of Law is continuing to send individuals to watch and report on the accused terrorists’ trials being held at Guantanamo Bay. Blog posts and articles from the observers chronicle the glacial pace of the proceedings, the unexpected courtroom twists and the nagging constitutional questions. 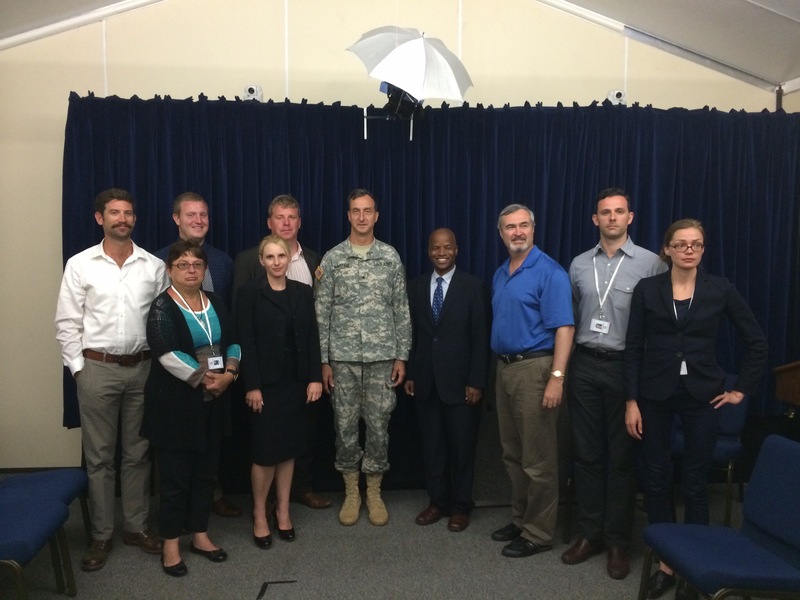 The project regularly sends faculty, students and alumni to either Guantanamo Bay or Fort Meade in Maryland to observe the tribunals. Professor George Edwards, founder and director of the project, explained the work of the observers is not to address the political issues or comment on the substance of the military commissions. He pointed out the observers also are looking at the stakes that the victims of the terrorists attacks and their families have in the proceedings. What about their rights to have access to the trials, to make statements, to confront and to have closure? IU McKinney librarian Catherine Lemmer, who Edwards described as instrumental in helping to build the observation program, heard some victims’ voices when she traveled to Guantanamo Bay for the hearings of the alleged co-conspirators of the Sept. 11, 2001, attacks. One man said he was attending the proceedings to remind the judge and attorneys that planes had flown into the twin towers of the World Trade Center and the Pentagon. A mother of a fallen firefighter said she was struggling to hang on to her opposition to the death penalty, but she believed the trials had to be fair because the United States would be judged by how it handles the detainees. The project drew praise from panelists who participated in a recent forum at the law school examining the tribunals. Hosted by the Indiana International & Comparative Law Review, the symposium brought together legal scholars from IU McKinney and around the country to discuss whether the end is coming for Guantanamo Bay or if the practice of international criminal law has reached a turning point. Two participants – Shahram Dana, associate professor at The John Marshall Law School and Chris Jenks, assistant professor at Southern Methodist University Dedman School of Law – on the second panel discussion both noted IU McKinney’s effort in documenting the proceedings at Guantanamo Bay is shining a light on America’s response to terrorism and will be an invaluable resource for history. Lemmer advocates for the proceedings to be shown on C-SPAN. The American public should see for themselves, she said, so they form their own opinions. By seeing what is happening in that courtroom, she said it is easy to realize how things could go wrong. Lemmer took her first trip to Guantanamo Bay in December 2014. However, the proceedings were derailed by the ongoing revelations that the Federal Bureau of Investigation may have infiltrated the defense teams. The FBI is accused of listening to defense attorneys’ meetings with their clients and reviewing their correspondence as well as attempting to turn legal team members into informants. When she returned in early February 2015, the FBI conflict-of-interest issue was still being argued. Then unexpectedly, Ramzi Bin al-Shibh, one of the defendants in the courtroom, said he recognized his interpreter as someone he encountered during the period he was held at one of the Central Intelligence Agency’s secret prisons. Another defendant told his attorney he also remembered the interpreter from the black site. “It became very surreal,” she said. To Indianapolis defense attorney Richard Kammen, the confusion and conundrums that swirl around Guantanamo Bay could be resolved by moving the proceedings to federal court. Kammen, lead counsel for USS Cole bombing suspect Abd al-Rahmin al-Nashiri, pointed to the hearings of accused Boston Marathon bomber Dzhokhar Tsarnaev as an example that U.S. courts can handle high-profile terrorism cases. “There’re so many more moving parts down there than there would be in federal court, so things just get more messed up,” he said. Currently, Kammen and his defense team are tangling with the federal government to release the details of the treatment of al-Nashiri while he was kept in a black site. The release of the CIA Torture Report publicly confirmed that the defendant had been physically, psychologically and sexually tortured, but Kammen said the defense still needs details of what was done and when. IU McKinney professor Lloyd “Tom” Wilson is scheduled to observe the al-Nashiri proceedings during his first trip to Guantanamo Bay. The task of watching and relaying what is happening will be difficult, he said, because he will be seeing just a snapshot of a long, complex and secretive process. Wilson was careful in his preparation for the trip, not wanting to form any preconceived ideas or prejudices before he arrived in the courtroom. He is going out of a sense of civic duty and to understand the situation better than he does now. Still, the proceedings are not easy to comprehend and continue to spark debate many miles away from the detention camp. Co-panelist Jenks countered that characterization, arguing traditional rules governing the treatment of prisoners of war have been upended by terrorism. In previous conflicts, nation states battled each other but now the United States is fighting against groups that are unconnected with any organized government or country. Even so, he continued, the detainees at Guantanamo Bay have a right to counsel and are being given a trial. Kammen responded that even if his client is acquitted, he will not be released. In Monday afternoon’s court session in the Guantanamo case involving the alleged mastermind of the 2000 USS Cole suicide bombing case, the defense claimed that Pentagon officials were interfering with the judge’s independence, threatening to undermine the entire case. The judge, Air Force Col. Vance Spath, is conducting further inquiry before determining whether unlawful interference exists, and if it does, what the remedy should be. The defendant, al Nashiri, was arraigned several years ago, and there have been many delays in this death penalty case. 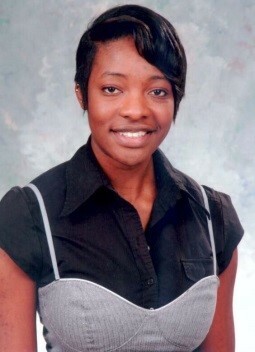 The officials stated in e-mails and other communications that they wanted the case to move more quickly, and one official signed an order commanding the judge to change from part-time to full-time on the case, and to physically relocate to Guantanamo Bay until the case was finished, which could be many months or years. The defense argued that only the judge controls the pace of the trial, and it is “unlawful interference” for a non-judicial official to seek to interfere with a judge’s command of his courtroom. Virtually all participants in the Guantanamo Bay cases live in the U.S. mainland, and commute to Guantanamo Bay for hearings. This includes the defense and prosecution lawyers, the court staff, the press and the NGO Observers, and the interpreters. The judges in this and the other two active cases are the only ones ordered to move to Guantanamo Bay. 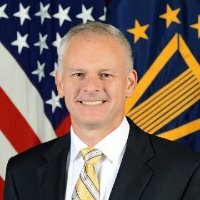 The chief prosecutor, who is a Brigadier General Mark Martins, was not ordered to move to Guantanamo, and neither were other military officers assigned to work on the cases. Judge Spath halted the hearings mid-afternoon after ordering the Pentagon official who made the order to testify about the order. 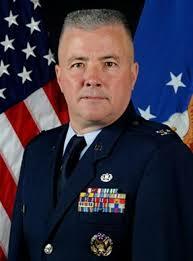 That official, called the Convening Authority for the military commissions, is Retired Major General Vaughn A. Ary. Judge Spath said General Ary could fly to Guantanamo Bay to testify, or he could testify by video. His testimony is expected as early as tomorrow, Tuesday, 24 February 2015. What is “unlawful interference” with the judge. The Guantanamo Bay Fair Trial Manual discusses law related to “unlawful interference”, and the independence of judges, and identifies a checklist of questions to ask in seeking to determine whether judges’ independence has been compromised. Under international and domestic U.S. law, judges are required to be independent, and are required to appear to be independent. Outside, objective observers should be able to view a judge and his decisions and not be concerned about whether some outside, non-judicial entity is “pulling the strings” or exercising unlawful command authority over the judge. All stakeholders in the Military Commissions have rights and interests. This includes not only the defense, which clearly has rights, but also includes the prosecution, the victims and their families, the media, NGO Observers, court personnel, security guards, and others. The Guantanamo Bay Fair Trial Manual outlines many of these rights and interests. 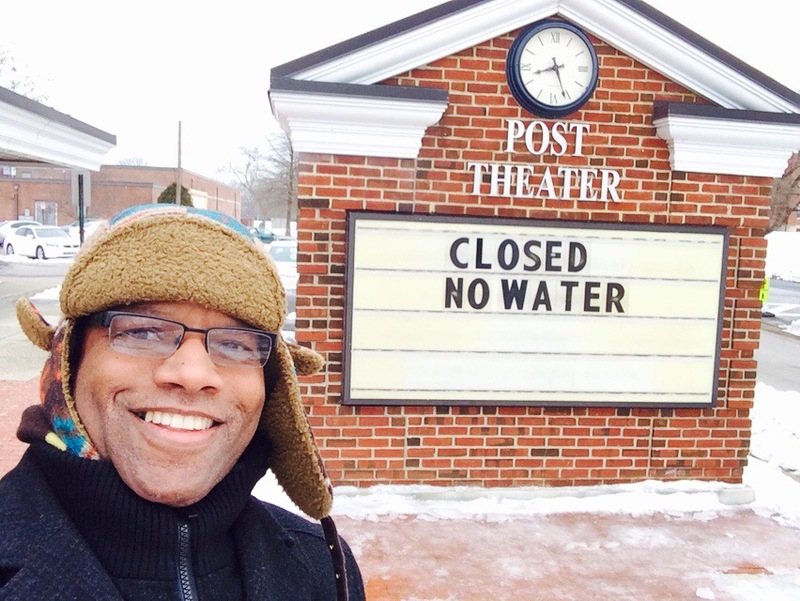 In front of the Post Theater at Ft. Meade. I am up early this Monday morning for my first visit this year back to Ft. Meade, Maryland to monitor Guantanamo Bay, Cuba hearings in the U.S. Military Commissions case against al Nashiri. He is the alleged mastermind of the U.S.S. Cole suicide bombing in 2000 that killed 17 U.S. sailors. What, Guantanamo Bay proceedings in Maryland? Yes. 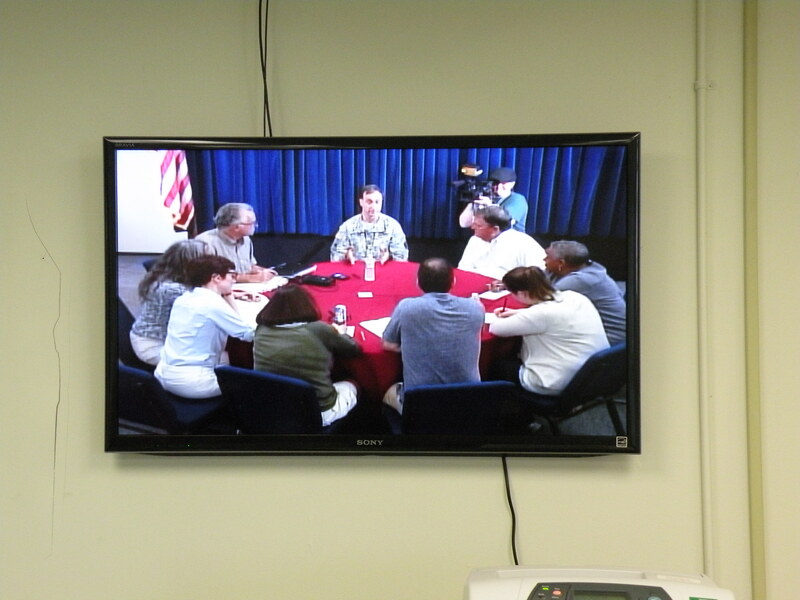 The Pentagon runs a secure videolink direct from the Guantanamo Bay courtroom to select viewing sites in the U.S. where press, NGO Observers, victims and their families, and others may view the proceedings. The only site in the U.S. at which NGO Observers and members of the public may see what’s happening in the courtroom is at Ft. Meade, Maryland, about 35 miles outside of Washington, DC. It’s kind of like watching a Court TV show, except that the viewing venue at Ft. Meade is an actual live theater, where they screen first run movies on a huge commercial theater-sized screen, and host live plays, lectures and other activities on a stage. Its concession stand sells buttered popcorn, Milk Duds and Skittles, and fountain drinks. This week’s feature film is Selma, screened in the evenings after the Guantanamo courtroom goes dark. The al Nashiri case is in the pre-trial hearing stage. Every month or two they schedule two weeks of court time in which defense and prosecution lawyers argue about logistical, substantive, or technical issues to be resolved before the actual trial begins. 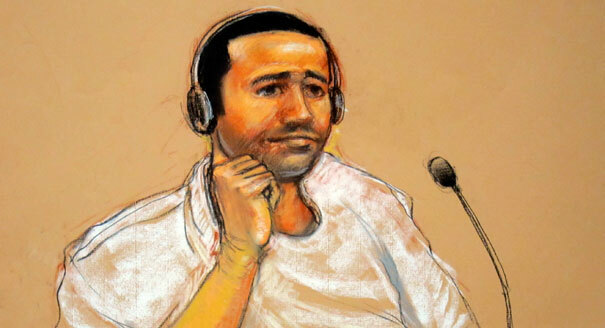 For the February 2015 hearings, the lawyers are arguing whether the prosecution must provide the defendant certain information, whether al Nashiri will face the death penalty, and the relevance of the U.S. Senate’s 2014 Torture Report. But before they reach those issues, they are arguing over whether certain Pentagon officials are exercising “unlawful influence” over the al Nashiri judge, who like other Guantanamo Bay judges was ordered permanently to relocate to Guantanamo Bay and surrender all non-Guantanamo judicial responsibilities, as these changes purportedly would help speed up the trials. U.S. law clearly provides that judges are to be in control over their trials, including the speed at which their trial proceed, and outside U.S. government officials are not meant to intervene. I won’t know what will happen in today’s hearings until 1:00 p.m., since the morning session, which was scheduled to begin at 9:00, is closed to NGO Observers. I have over four hours of out-of-court time to catch up on reading al Nashiri court documents, blog writing, and working on the Guantanamo Bay Fair Trial Manual. Getting to Ft. Meade is not easy. 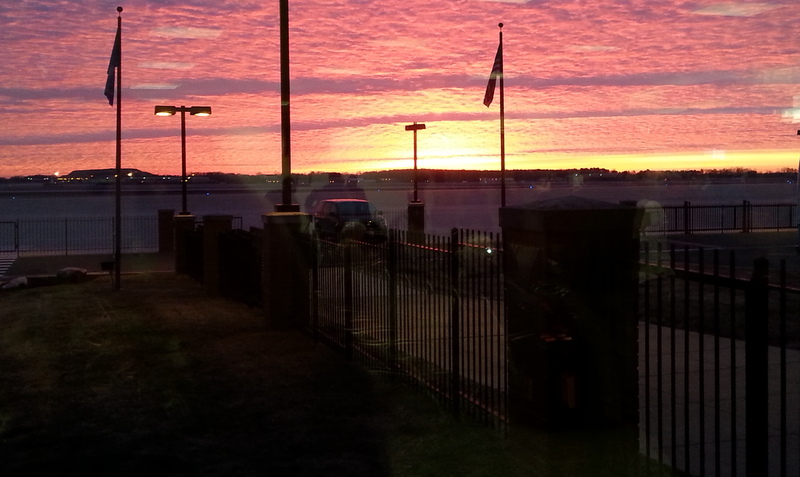 I woke up this morning before 6:00, and took a taxi from my downtown DC hotel to Washington National Airport, where I rented a car to drive to Ft. Meade. The taxi ride to the airport was historically scenic, passing the Watergate, the Washington Monument, and Arlington Cemetery. Driving from the airport to Ft. Meade was slow, not because of rush hour, but because much of the 35 miles to the base is on narrow, two lane roads with many stop lights. I will try another route back to DC this afternoon. Perhaps it was a GPS problem? It might be an advantage driving into DC when most of the traffic is driving out at the end of the day. 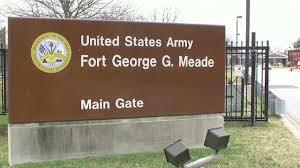 All said, it was a pretty uneventful trip, which took about an hour from airport to the Ft. Meade Visitor’s Entrance. I remembered from last time I was here where the Ft. Meade Visitor’s Entrance is, off of Reese Road, and pulled up to the base security checkpoint. But I’d forgotten about the separate vehicle inspection line, just to the right before base security. So I had to make a quick U-turn, adding 30 seconds to my journey. The vehicle inspector asked me a few questions about my Indiana drivers license, my rental car contract, and whether I was a member of the press. He was easily convinced that I was a credentialed NGO Observer, and very generously gave me a Ft. Meade color map, on which he traced lines to the Post Theater, where I am now. I arrived here just before 8:30 a.m., took a couple of selfies in front of the Post Theater sign, and then bumped into Bev, who is a Department of Defense contractor who I believe supervises this viewing site. She announced to me that court was commencing at 9:00 a.m., but that the morning session would be closed to NGO Observers. They close the proceedings when they are discussing classified information that NGO Observers, victims and their families, press, and others are not permitted to hear. So, none of us can be in the courtroom or on a video-link, whether we are in Guantanamo Bay or Ft. Meade. So, what do I do for the next four hours from 9:00 – 1:00 waiting for the open hearing? I could drive back to Washington, and come back this afternoon. But that would be a wasted time. So, of course, I immediately thought that this would be a great time to catch up on Gitmo Observer blog writing, to review court documents in the al Nashiri case, and to brush up on the Guantanamo Bay Fair Trial Manual. Drug sniffing dog Axa and her handler at Post Theater today, after finding all the drugs planted by the MPs. A little while after I entered the Post Theater, a group of Military Police (MP) Canine Patrol staff came in, asking whether the Guantanamo Bay hearings were on. I told them that the hearings were closed until 1:00 p.m., and that there would be no live broadcast until then. In fact the screen was showing the morning news, with stories about al Shabaab and threats to U.S. shopping malls and the weather. 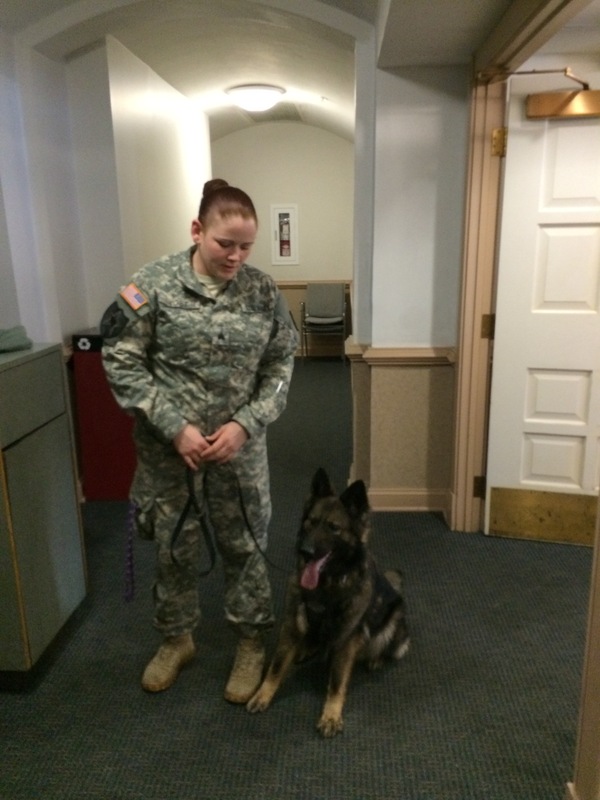 The MPs said that they wanted to do some training with some of their dogs. The next hour or so was extremely interesting, watching 5 different dogs successfully sniff out planted explosives and illegal drugs that the MPs planted in different parts of the theater. The first dog, a black lab, was an explosives expert. She found three different satchels of explosive powder and other incendiary material, hidden inside a trash can, underneath a movie theater seat, and high above the arch of a doorway. All in record time. After each find the shiny, fine-coated lab received an award, a tug and tussle with a “kong”, which is a plastic toy attached to a colorful twisted heavy rope. The next two explosive expert dogs performed equally as well, quickly finding all the planted explosives and receiving well-deserved treats. Fram – A drug sniffing dog and his handler this morning, after the 9-year old canine gracefully located all of the drugs planted by the MPs. MPs had hidden the drugs on the opposite side of the theatre from the explosives. Axa’s handler gently waved her open palm towards the trash can next to the door leading from the lobby into the theater, and Axa did not react. The handler repeated the hand gesture, called a presentation (the hand wave gesture), this time towards the door frame. Axa stood on her hind legs and leaned against the door frame, circled around beneath the frame, stood up again, and excitedly sat on her hind legs. Axa found the 5 grams of marijuana hidden in the frame above the door. She was rewarded with a yelp by the handler who tossed Axa a kong for finding the pot. Axa then found cocaine in a trash can in front of the theater, and ecstasy underneath a seat in about row 8. 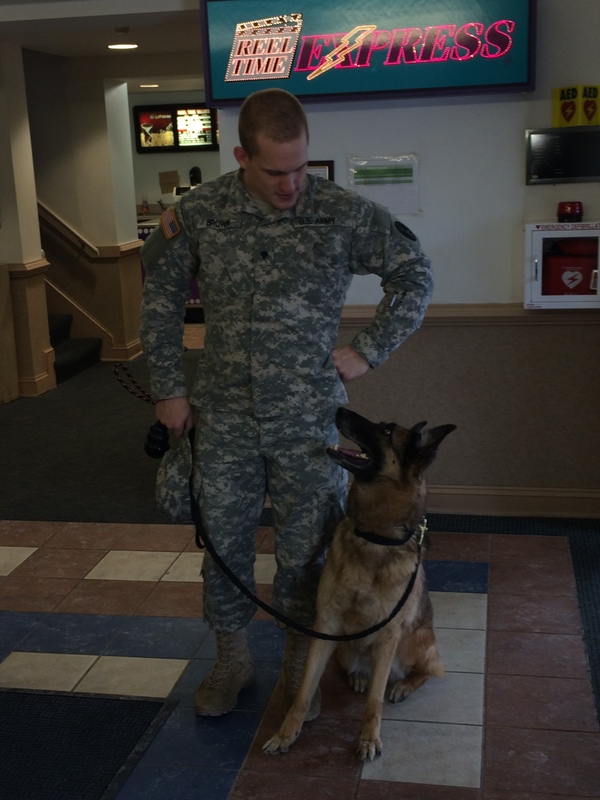 Axa is only 2 years of age and has been working as a canine sniff dog only since October 2014. Well done. Finally, Fram, the senior sniffer, was brought into the theater. Fram was 9 years of age, lived his first 7 years in Germany, and arrived at Ft. Meade only 2 years ago. He was seasoned, he knew the drill, and he was very good at what he does. Today Fram earned his kongs, and hugs from his handler who said “I’m going to adopt Fram when he retires”. Several other handlers chimed in “No you’re not! I’m going to adopt him”! So, we’ll see who ends of with a handsome, smart and talented dog who even at the ripe old age of nine did not look like he was anywhere near retirement. Dog Handlers are gone — What Next? The dog handlers have left, and I’m back to full concentration on my work (despite interruptions by a person stopping in to ask for directions to a base office, a guy coming in to turn on the bathrooms’ water which had been turned off over the weekend to prevent frozen pipes during the snow storm, and a guy changing lightbulbs above the concession stand. My next post will have more substance and will report on my al Nashiri motion-review and my Guantanamo Bay Fair Trial Manual work. I am scheduled to travel to Guantanamo Bay, Cuba to monitor the Al Nashiri Hearings at U.S. Military Commissions from 2 – 7 March 2015. This is the case against a man, al Nashiri, who is charged in these proceedings with having being a masterminded of the October 2000 attack on the U.S.S. Cole, docked off the coast of Yemen, killing 17 U.S. sailors and wounding dozens more. At Guantanamo Bay, I will be representing Indiana University McKinney School of Law’s Program in International Human Rights Law, which has received NGO Observer status by the Pentagon. This human rights program created the Military Commission Observation Project, and the Project nominated me for this mission. I have a Bachelor of Law from Moi University based in Eldoret Kenya (’09). I also hold a Master of Laws (LL.M.) degree in International Human Rights Law (’11) from IU McKinney, which is how I primarily got involved with the Program in International Human Rights Law. In 2010, I was an intern in this human rights program, working in Vienna Austria in. As an International Human Rights Law student in Prof. Edwards’s classes, I gained valuable gainful insight into international criminal law, and the Guantanamo Bay case of David Hicks, on which IU McKinney students worked and on which Professor Edwards served as an expert witness. I am currently studying International Research Ethics, but have not lost my interest in international law. I have had an interest in international law for many years now, but certain events heightened my desire to understand international criminal law and international humanitarian law. On August 7, 1998, the US Embassy in Nairobi, Kenya was bombed, killing over two hundred person, wounding countless people, and causing significant property damage. There was a similar terrorist attack in neighboring Tanzania. The blast rocked our notions of the relative peace and security we had experienced as a nation. Al Qaeda claimed responsibility, and terrorism was at doorstep of my East African home. 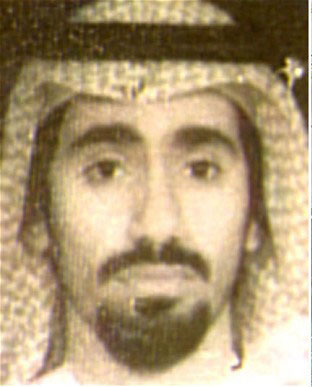 Al Nashiri was a suspected mastermind of those East African bombings, and one of the suicide bombers, the driver of the truck carrying explosives who attacked the Embassy, was his cousin, Azzam (pg. 152, 9-11 Commission Report). It was purely coincidental that I was approved for the Al Nashiri hearings. Although as a nation we lost family and friends, I naturally was inclined to seeing all those involved pay for their crime. At the same time, reading about the torture that alleged masterminds and perpetrators were subjected to left me conflicted as a human being, and a continued believer in the universality and inalienability of human rights. With this background and my academic experience in international law, I am eager to attend the hearings and apply what I have learned to assess whether the accused are accorded fair trials, and whether the rights and interests of all other stakeholders are being fully afforded to them. I admired the work of the IU McKinney PIHRL before I even joined McKinney School of Law. In 2009, I was fortunate to meet Prof. Edwards in Eldoret, Kenya, and had a chance to work with interns from PIHRL who did their internships in the legal office where I worked in Kenya just after I completed my law degree. As an affiliate of Professor Edwards’ program, I was very proud when it earned United Nations ECOSOC Special Consultative Status, and very proud when the Pentagon granted the PIHRL NGO Observer Status to the Military Commissions. Courtroom sketch of al Nashiri by artist Janet Hamlin. As mentioned, al Nashiri is charged with masterminding an attack on USS Cole in October 2000 and on. He faces charges in perfidy, murder in violation of the law of war, attempted murder in violation of the law of war, terrorism, conspiracy, intentionally causing serious bodily injury, attacking civilians, attacking civilian objects, and hazarding a vessel. I look forward to attending the hearings. I am however conflicted. The purpose of allowing observers is to ensure free and fair trials are conducted before the Military Court at Guantanamo, yet the process is riddled with torture and gross human rights abuses. I have received countless of emails from human rights based organizations, to sign petition for the closure of Guantanamo Bay. I cannot say that I have made any active advocacy efforts towards this end. I find it unsettling after claims and evidence of illegal detention and a flagrant violation of rights, there is an interest in the right to a fair trial. At the same time, terrorist continue to launch attacks against innocent human beings. I have witnessed this in Kenya, and continue to witness it with the constant threats from the militant group Al- Shabaab. I desire justice for the victims of terrorism, and respect for human rights for those accused. My journey to Guantanamo begins March 1, and will return to the country on March 7. I will be posting my observations on this blog as I continue to prepare, and updating on the hearings on a daily basis. I look forward to meeting other NGO Observers who will be there, attending the hearings and applying the Guantanamo Bay Fair Trial Manual to give an objective and personal view of the proceedings. I’m traveling to Washington, D.C. this morning, bound for Ft. Meade, Maryland where on Monday morning I plan to monitor Guantanamo Bay US Military Commission hearings in the case of al Nashiri, a man accused of masterminding the suicide attack on the U.S.S. Cole off Yemen’s coast in 2000. Not everyone who wants to view Guantanamo Bay hearings is able to travel to Guantanamo Bay. It’s complicated to get there. The Pentagon has opened a few select viewing sites for interested persons to view what is happening in the Guantanamo Bay courtroom, via secure videolink. It’s kind of like watching a courtroom drama on TV, and that courtroom scenario is real. My colleague Professor Tom Wilson of Indiana University McKinney School of Law is scheduled to fly to Guantanamo Bay tomorrow, Sunday, to monitor the al Nashiri hearings. He will blogging about rights of all Guantanamo Bay stakeholders. He will also be telling us at Ft. Meade what is happening outside the Guantanamo Bay courtroom that we can’t see or hear in Maryland. The photo is of a group of NGO Observers at Guantanamo Bay in August 2014, on my last mission to the Cuban military base. During the last full week of March 2015, I will travel to Guantanamo Bay (GTMO), Cuba as a member of the Military Commission Observation Project (MCOP) at the Indiana University Robert H. McKinney School of Law. It’s an honor to have been selected. 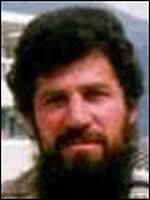 I will observe military commission proceedings for Abd al Hadi-al Iraqi, who arrived from CIA custody to GTMO in 2007. In 2013, the United States government charged him with denying quarter, attacking protected property, using treachery or perfidy, and attempted use of treachery or perfidy in a series of attacks in Afghanistan and Pakistan between about 2003 and 2004, and conspiracy to commit law of war offenses. Whirlwind is a term I have seen associated with the process of becoming a fair trial observer as a part of the Military Commission Observation Project (MCOP). I didn’t really have any previously determined thoughts on GTMO that were fully fleshed out by thorough law school level research. Prior to conducting research, I think my level of knowledge was comparable to that of the average American. Though, maybe slightly than more than average, given that I have known several members of the military who served there. Nevertheless, I have begun the process of researching and learning as much as possible about the project itself, the circumstances surrounding the operation of GTMO and military commissions, and the specific case I will observe. Absent a background in international law, the Guantanamo Fair Trial Manual has been a great resource in becoming familiar with the various sources of law that are implicated in the military commission system. In addition, I’ve had to explore my thoughts and feelings about what the overarching principles of justice really mean as applied to GTMO. As is with any person, my life experiences have shaped my perspectives on the ethical components of domestic and global issues. Despite my penchant for world travel, becoming a member of MCOP is admittedly my first law school experience dealing with any area of international law. During my second year of law school I worked as a part-time law clerk for the Marion County Public Defender Agency. Following that, I volunteered with the Neighborhood Christian Legal Clinic’s Expungement Help Desk, where I informed members of the community about Indiana’s expungement law. In July 2014, I began working full-time for the Indiana Bureau of Motor Vehicles, and next month I will begin as a part-time law clerk for the Indiana State Personnel Department. This semester I have been fortunate enough to extern for Justice Steven H. David of the Indiana Supreme Court. 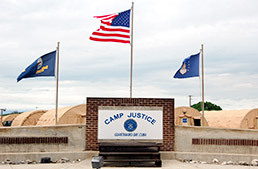 From July 2007 to August 2008, Justice David (at the time Colonel David) was the Chief Defense Counsel for the Military Commissions at Guantanamo Bay. 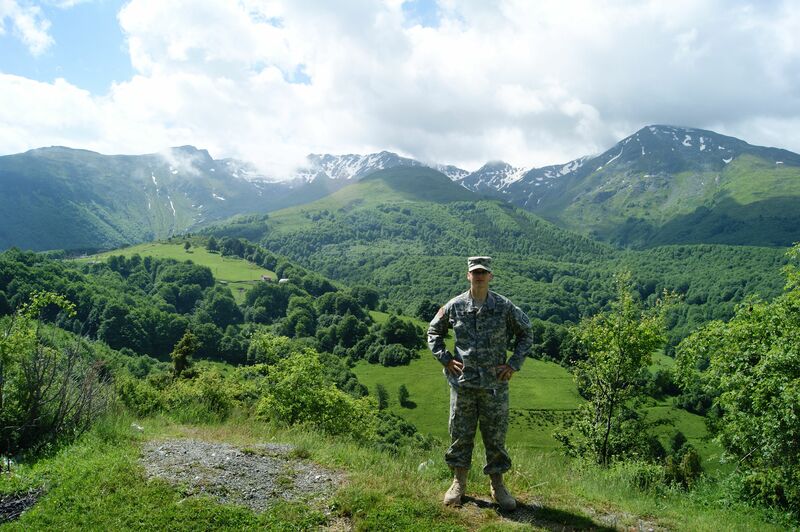 As a member of the Army National Guard for over 10 years, I deployed once in 2011 to Kosovo as a part of Kosovo Force (KFOR) 14. KFOR has been a part of the larger multinational presence in Kosovo since 1999. In addition, I have personally participated in the military funeral honors ceremonies for 323 veterans, a handful of which have been Iraq and Afghanistan war casualties. In no way does this fuel personal anger or hatred towards the detainees held in GTMO. Those servicemen were honored for their sacrifices for democracy that implores fairness in the service of justice. On the contrary, it is all the more reason for me to ensure I am doing everything within my power to help the MCOP fulfill its missions (attend, observe, analyze, critique, and report). 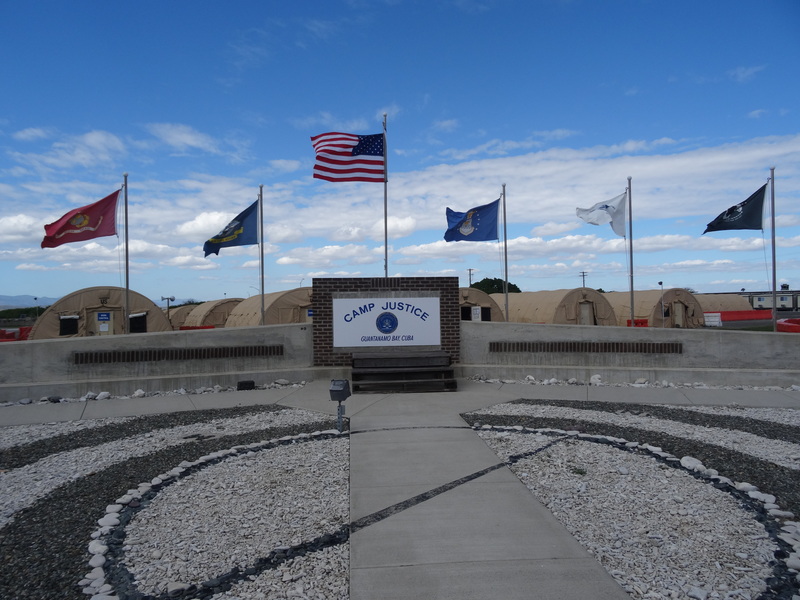 As a part of that mission, I have been tasked with expanding the portion of the Guantanamo Fair Trial Manual covering the rights and interests of the men and women in Joint Task Force Guantanamo (JFT-GTMO). 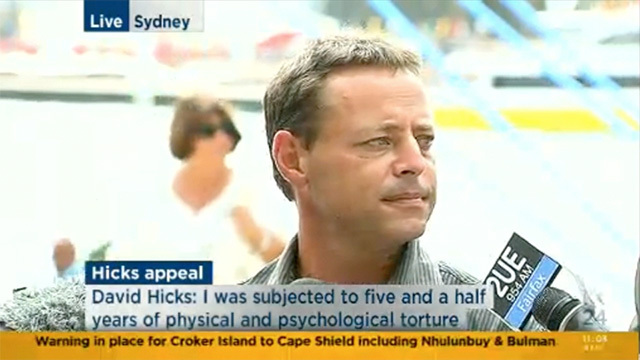 A U.S. military appellate court overturned Australian David Hicks’ 2007 Guantanamo Bay conviction on charges of “material support for terrorism”. On 18 February 2014, the U.S. Court of Military Commission Review ruled that the crime Hicks was convicted of did not exist as a matter of law before 2006. The alleged criminal acts occurred in or before 2001, before “material support for terrorism” was criminalized. A copy of the court’s ruling is below in full text or here: Hicks v. United States (CMCR 2015). Hicks’ Defense Team at Andrews Air Force Base after his conviction for material support for terrorism, which was overturned on 18 February 2015. Left to right – Professor Tim McCormack (Australian Expert Witness), Professor George Edwards (U.S. 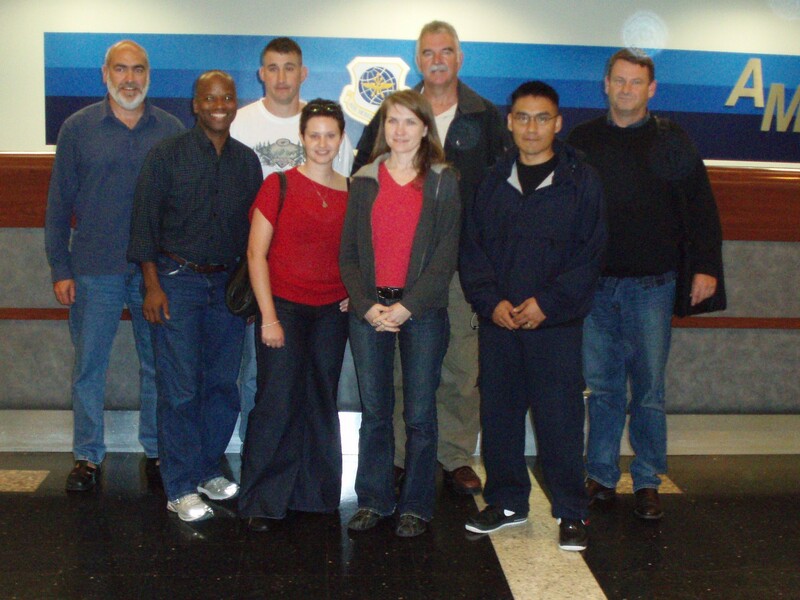 Expert Witness), Major Michael “Dan” Mori (Hicks’ Detailed Military Counsel), (Sarah Finnin, Australian civilian volunteer), Rebecca Snyder (Military Counsel Detailed as Civilian Counsel), Mick Griffith (Australian Civilian Counsel), Sergeant Rios (Team Assistant), Dave McCleod (Australian Civilian Defense Counsel). 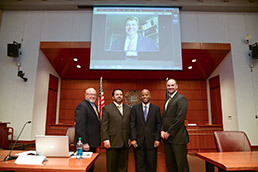 Professor George Edwards and his students from the Indiana University McKinney School of Law provided pro bono legal research for Hicks’ defense team from 2004 until Hicks’ 2007 guilty plea. Professor Edwards was also tendered as an expert witness on the Hicks case, along with Professor Cherif Bassiouni, Professor Tim McCormack, and the late Judge Antonio Cassese. The Military Commission prohibited the experts from testifying live, and in lieu of live testimony, the experts provided affidavits. Professor Edwards’ two affidavits were on the right to a fair trial under international humanitarian law (the law of war / law of armed conflict), international criminal law, and international human rights law. During Hicks’ 2007 guilty plea, Professor Edwards (from the U.S.) and Professor McCormick (from Australia) were in the Guantanamo Bay courtroom, and are believed to be the first expert witnesses permitted to travel to Guantanamo Bay for a U.S. Military Commission. Hicks was sentenced to 7 years in prison, with most suspended. He remained at Guantanamo for two months after pleading guilty, and then after 5 ½ years at the remote island prison was returned to Australia, where he spent an additional 7 months in prison before being released. According to Military Commission spokesperson Myles Caggins, the U.S. government will not appeal the appellate court’s ruling. Hicks’ military lawyer for his initial Guantanamo Bay proceedings, Lt. Col. Michael Dan Mori (ret.) (then Major Mori) was not available for comment. He is pictured above with the Hicks defense team as they arrived back at Andrews Air Force Base after the March 2007 guilty plea. 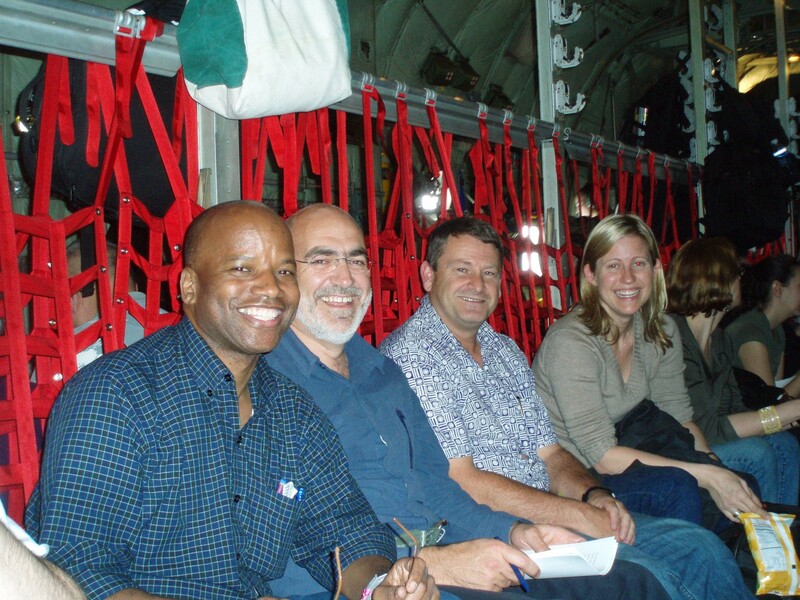 Pictured also in this post are Professor George Edwards (Indiana University McKinney School of Law) and Professor Tim McCormack (University of Melbourne Faculty of Law), on a military aircraft traveling from Andrews Air Force Base outside Washington, DC to Guantanamo Bay, Cuba for the U.S. Military Commission proceeding during which Hicks pleaded guilty in March 2007. Seated next to them is David McCleod, an Australian lawyer who served as Hicks’ civilian defense counsel. A copy of the Indiana University’s Guantanamo Bay Fair Trial Manual can be found here. 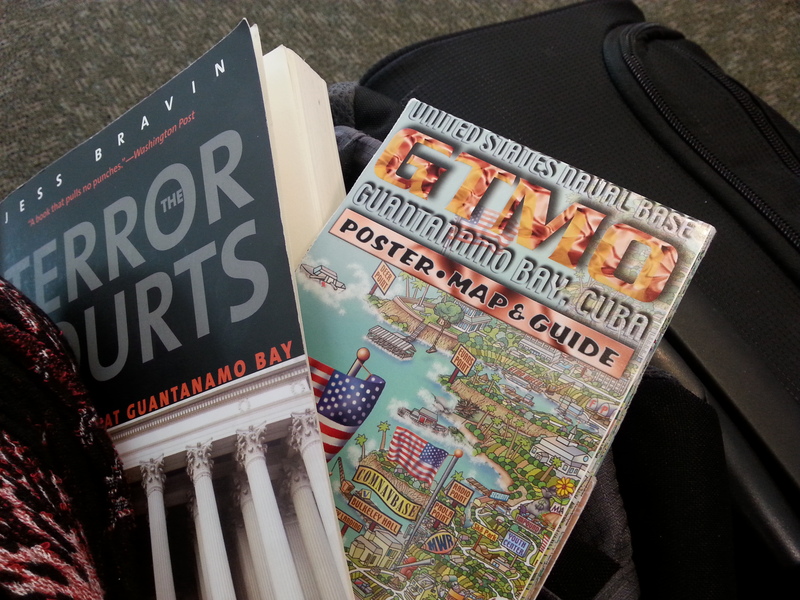 I am en route via Chicago and Washington D.C. to Guantanamo Bay, Cuba for the first week of the 9/11 hearings. The hearings are scheduled to start at 9:00 am on Monday, 9 February 2015. Judge Pohl has ordered that all five defendants must be present in court. The first issue to be addressed during this session is reconsideration of Judge Pohl’s order of August 2014 (AE312) to sever Ramzi bin al Shibh’s case from the other four 9/11 defendants. Mr. in al Shibh’s case was severed as a result of the prosecution’s request for a competency hearing for him as well as the conflict-of-interest matter arising from FBI investigation into his defense team. If this sounds familiar, it should. These same motions were scheduled for hearing but not heard when the December 2014 hearings were cancelled over the female guard issue. The resolution of the potential conflict-of-interest matter is a complex issue that has delayed the hearings for nearly a year. In 2014, the Military Commission concluded that there was no actual or potential conflict with respect to four of the five 9/11 defense teams. The Military Commission did conclude that there may be an actual or potential conflict with respect to the legal team representing Mr. bin al Shibh. In August, Judge Pohl ordered Independent Counsel for Mr. bin al Shibh to investigate and advise him. Lt Col Julie Pitvorek, USAF was assigned as Independent Counsel for Mr. bin al Shibh. LtCol Pitvorek will be present at the February hearings, as will Mr. Harrington and Lieutenant Commander (LCDR) Bogucki, Mr. bin al Shibh’s present counsel. In April 2014 a Special Review Team consisting of Department of Justice prosecutors was appointed to investigate the FBI’s undisclosed interviews and investigations of certain members of the 9/11 defense teams. The creation of the Special Review Team was required because General Martins’ prosecution team can not investigate the defense teams. The Special Review Team functions as the prosecution with respect to the investigation of the defense teams and whether the FBI activity created a conflict-of-interest for the defense team. The Special Review Team was in court at the preliminary hearings in June, August, and October on behalf of the prosecution. These prosecutors will be in court for the February hearings to represent the government for the three pleadings that will be heard by Judge Pohl related to these matters. Should these matters be resolved, the parties will move on to the many other matters scheduled for argument in the following weeks. The matters before the Military Commission are legally and factually complex. It makes it challenging for NGO Observers tasked with observing, analyzing, and reporting on whether the military commissions are open, transparent, and providing fair trials to the defendants. It is important that we focus on our specific role in the process. 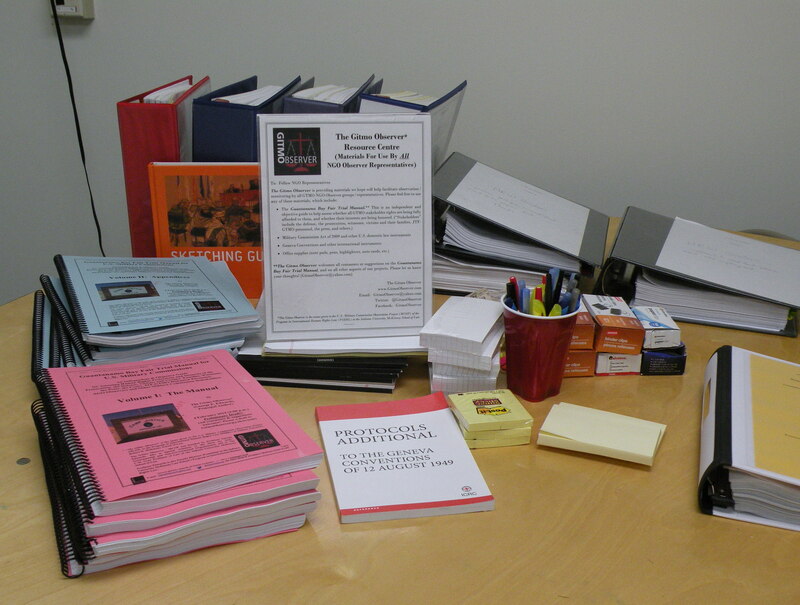 The Guantanamo Bay Fair Trial Manual is a great tool to help us do so.